How do we explore the depths of our experience, seeing underneath that which appears on the surface? What we call Consciousness depends on our level of observation and mystical penetration. The most common error is conflating Consciousness and Awareness. "Human nature [hsing] and consciousness [hui] are expressed in light symbolism, and are therefore intensity, while life [ming] would coincide with extensity. The first have the character of the yang principle, the latter of the yin." Light is the fundamental archetype of reality. It appears when the Ouroboric zero-point bursts open in radiant glory, from the unfathomable primordial darkness. The ground of our being arises beyond our observation, but can be inferred by its tangible effects. Changes of the sub-quantum level are described as "virtual" and unobservable. This is the virtual substructure of scalar and vector potential. The vacuum, which plays the key role in structuring universe, is a cosmic virtual state hologram. The quantum vacuum is a dynamic massless scalar field. A hologram is a scalar field. Scalars are just active information; a hologram is pure information. Entanglement is a property of nonlocal quantum information exchange. The holographic frequency domain is a plenum which projects the information from the deepest level of the structure of space into the material domain. Thus, the image of the whole is a ubiquitous presence in greater or lesser resolution. The infinite is an aggregate of finites -- discontinuous events. We might regard an EM wave as a wiggle of nothingness, existing in time, which is like saying that a photon is an oscillation (wiggling) of spacetime itself. Photons are discrete energetic events, wave undulations of surface patterns. The holographic field supports the photonic field at every point in space (with or without perceivable energetic events) with the energy of the entire cosmos. Photons do not have mass; they do have momentum. Einstein’s equations predict that from light’s own point of view time has stopped, and distance has shrunk to zero. So all light knows is ‘now’. It doesn't exist in time and space as we do. Light, somehow, lies beyond the world of space, time, and matter. It is not part of the material world. The discrete 'particle' properties of Matter and Light (quanta) are in fact caused by standing wave interactions. Radiant energy is the energy gradient of electromagnetic waves at different frequencies. The photon field is a flow of light. Whether we look outside into our environment or inside into ourselves we find primordial Light. Light is the first and only thing to emerge from the Unknown. Light is the archetype of the revelation of ultimate reality. Aether has no reference points, no meaningful motion, no time, no wave fronts, just absolute space. At the hyperspace level of observation, we find EM waves, strings, branes, quanta, etc. Finally, classical spacetime emerges, the objective Universe as we naturally perceive it. The infinitesimal center is coextensive with the universal continuum. The active vacuum is active spacetime. Mass moves through time by integrating virtual photons, and absorption / emission of observable photons / biophotons. The internal dynamic flow of time has infolded sublevels and engines that pump up the quantum field effects to breech the mystic threshold of observability. Tesla referred to this form of negative energy as radiant energy. 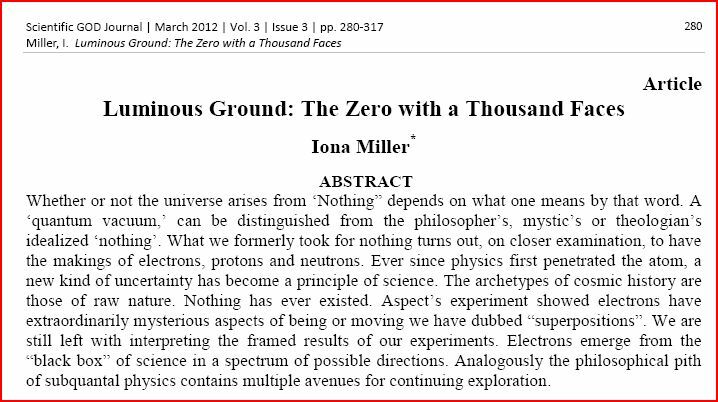 At the interface where nothing becomes something, nonluminous virtual photons teem in the zero-point field. Mass attracts photon flux from the vacuum. The radiant ground is the fundamental source beyond the boundary layer of quantum foam. Photons are the self-luminous manifestation of Absolute Space. Nothing arises but standing waves from the seething zero-point field of creative potential. It is the source and sustenance of existence -- the light of life itself. We are bioholograms projected by coherent light and sound. We arise from and are sustained by field phenomena. Waves of biophotonic light and sound form our essential nature through acoustic holography This coherent light transduces itself into radio waves. This holographic biophoton fieldcarries sound as information that decodes the 4-D form as a material object. The mindbody is electronic, but it is rooted in the luminosity of its invisible ground. We now know that our universe is awash in a background sea of diverse light waves, countless fields of them, all occupying the quantum vacuum of local and outer space. It’s a titanic ocean full of electromagnetic riptides, which wields influence everywhere -- the renewable energy of always. Light is the fundamental archetype of Reality and undifferentiated consciousness. When the great ouroboric round breaks open, light is born in the world. Light is often contrasted with some form of human darkness, but in this case it emerges from the primordial darkness of the nonmanifest unfathomable depths. The ground of our being arises beyond our observation, but can be inferred by its effects. Changes smaller than the quantum level are described as "virtual" and unobservable -- the virtual substructure of scalar and vector potential. The vacuum, which plays the key role in structuring universe, is a cosmic virtual state hologram. The quantum vacuum is a dynamic massless scalar field. A hologram is a scalar field. Scalars are just active information; a hologram is pure information. In the Sefer Yetzirah, the Ayin is called the "Organ of Nakedness." In Arabic, the word for the NOT is "La": this is written virtually identical to the Ezra letter Ayin. The shape of the Phoencian or Sinatic letter Ayin is also suggestive -- it is a circle. The morpohological or geometrical aspect of nature plays a dynamic role in the identity and behavior of all objects and processes. In Synergetics, a geometrical system of holistic thinking, Buckminster Fuller described Cosmic Zero at the geometrical heart of the Vector Equilibrium Matrix. This is the geometry of the the Unified Field — the "zero-phase of conceptual integrity inherent in the positive and negative asymmetries that propagate the differentials of consciousness." When it comes to modeling a most fundamental aspect of physics wherein the zero-point field of energy has infinite density yet cannot be seen or measured, the vector equilibrium simply and absolutely fulfills this ground-zero starting place from which everything else springs forth. The pairs of opposites are the qualities of the Pleroma: they are also in reality non-existent because they cancel each other out. ... Since we ourselves are the Pleroma, we also have these qualities present within us; inasmuch as the foundation of our being is differentiation, we possess these qualities in the name and under the sign of differentiation..
We're beginning to understand what nature has been hiding. The zero-point field is a blinding light. Since it is everywhere, inside and outside of us, permeating every atom in our bodies, we are effectively blind to it. It blinds us by its presence. The world of light that we do see is all the rest of the light that is over and above the zero-point field. We cannot eliminate the zero-point field from our eyes. So, the vacuum is filled with a distinctive pattern of electromagnetic fields. Even with its pattern of electric and magnetic fields in continual fluctuation, the vacuum remains the simplest state of nature. Life takes refuge in a single space - absolute space -- the luminous core of meaning itself. Pre-spacetime is the absolute frame of reference, the ground of existence. Pan-protopsychism and pan-experientialism describe emergence of primal non-conscious processes. Panprotopsychism suggests proto-consciousness may exist in the universe as a “fundamental property” without depending at all on anything physical. These notions suggest that, by focusing on experience rather than mentality, pan-experientialism avoids some of the traditional objections to panpsychism. Absolute space is the noumenal source of phenomenal consciousness, a fundamental quality, and Mind is a higher order hyperspace field outside brain's EM field. Fundamental proto-consciousness finds more particular expression when matter comes together in a certain way. Physics still struggles to describe this process, but is currently looking toward spin and entanglement as observable clues. ~Carl Jung, Letters Volume 1, Pages 420-422. Pure consciousness, non-conscious, consciousness, pre-conscious, awareness, and attention. Pure consciousness, n in the Vedic tradition and Ayurveda, the ground of being that manifests as the totality of creation. Jonas: Mosby's Dictionary of Complementary and Alternative Medicine. (c) 2005, Elsevier. Do we each remain pure consciousness and negentropic force? Does our timeless awareness sustain evolutionary creation? Can we see that our negentropic force allows continuous creation? Is the pure consciousness of the universal vacuum the beginning and end of creation? Is the luminosity of the vacuum nature the same as the "luminous ground" of pure awareness? How can the direct experience of our light nature enhance personal and planetary evolution? consciousness can be defined as that abstract and mysterious something that has the potential to know. The field of pure consciousness can be understood as the subjective essence of the unified field, which acts as the ultimate origin of creation. It not only acts as the origin of all individual thoughts, but also all of the forms and phenomena in nature. In Sanskrit the word for pure consciousness is chit. The ancient Vedic texts tell us that pure consciousness is capable of knowing itself, by itself, through itself alone. without any dependence upon the empirical world, and that all subject-object relations arise as mere vibrations of consciousness. That which is infinite, self-ruled, and mixed with nothing but itself, is none other than the field of pure consciousness. That field, which is the one eternal Self of all beings, is also the omniscient, omnipotent, and omnipresent Ruler, the Supreme Being, who acts as the ultimate origin of all things by merely knowing itself—that is, by merely vibrating within itself. This is the essential teaching of the perennial wisdom, which has been bestowed upon mankind by the divine messengers since time immemorial. Empirical consciousness refers to the type of consciousness whose knowledge is born of empirical experience. This can be called empirical knowledge. It pertains to the phenomenal forms of created existence that abide within the physical Cosmos. Pure consciousness refers to the type of consciousness whose knowledge is born from pure intuition. This can be called pure knowledge. It pertains to the non-phenomenal forms of uncreated existence that abide within the metaphysical Logos. In Hindu philosophy, turiya (Sanskrit: तुरीय, meaning "the fourth") or caturiya, chaturtha, is the experience of pure consciousness. It is the background that underlies and transcends the three common states of consciousness of waking consciousness, dreaming, and dreamless sleep. then a materializing pattern, and finally a material pattern. “I am created by Divine Light. the realm of archetypal light and sound as pure consciousness. The photon is a quantum of action and light seems to be the first directly observable manifestation of Ultimate Reality. Virtual photon flux underlies photon emergence from compactified space. Neutrinos are almost massless, travel close to the speed of light, and pass through matter almost undisturbed. Photons, on the other hand, have no mass, travel at the speed of light, yet are absorbed and/or reflected even by fairly sparse matter. The aether is a three-dimensional environment, the space itself, and the transverse vibration of light is performed in a space with four dimensions. The aether is not being driven by the movement of bodies. Light is a form of transition from the three-dimensional space, the aether, to the space with four dimensions. As a general rule, the transition from a space with n dimensions to a space with n+1 dimension occurs by curving the n-dimensional space. A photon has an electromagnetic field that can interact with charged particles - a neutrino has no charge and so unless it hits something head-on, it doesn't interact. So both particles have little or no mass, travel close to or at the speed of light, and have no charge. But the photon has an electromagnetic field whereas the neutrino doesn't. Photons are electromagnetic fields, or rather waves in the electromagnetic fields. Noether's theorem demonstrates conserved quantities from symmetries of the laws of nature. Time translation symmetry gives conservation of energy; space translation symmetry gives conservation of momentum; rotation symmetry gives conservation of angular momentum, and so on. In matter, light's (broken) symmetries are conserved by charge and spin; in spacetime, light's symmetries are protected by inertial forces, and conserved (when broken) by gravitational forces. All forms of energy originate as light; matter carries charges which are the symmetry/entropy debts of the light which created it (both concepts are required to fully integrate gravity - which has a double conservation role - with the other forces). Charges produce forces which act to return the material system to its original symmetric state (light), repaying matter's symmetry/entropy debts. A photon is the basic action quantum. It may be considered as an oscillation in and out of time. It may also be considered as a virtual pattern of positron/electron pairs. It is a piece of electromagnetic radiation when it interacts as a particle. One half of the photon exists in and carries positive time (negative charge), and the other half exists in and carries negative time (positive charge). Thus, one half is "normal" and the other half is "time-reversed" (phase conjugated). The generally accepted theory of light up until the mid 1800's, was Newton's assertion of light to be a stream of tiny particles. However, in the late 1800's, the particle picture was replaced by the wave theory of light due to the phenomena associated with light: refraction, diffraction and interference, which could only be explained using the wave picture. This electromagnetic radiation, or light, may be viewed in one of two complementary ways: as a wave in an abstract electromagnetic field, or as a stream of massless particles called photons. This is known as the wave-particle duality and is true for all particles. This duality is the basis of a indisputable quantum law in which it is a thread that runs throughout the micro and macrocosm. Light as a wave, has a wavelength associated with it, much like an ocean wave with crests and troughs. The frequency of light is measured by counting the number of waves passing one point at a given time. The energy is merely the strength or force the wave carries. 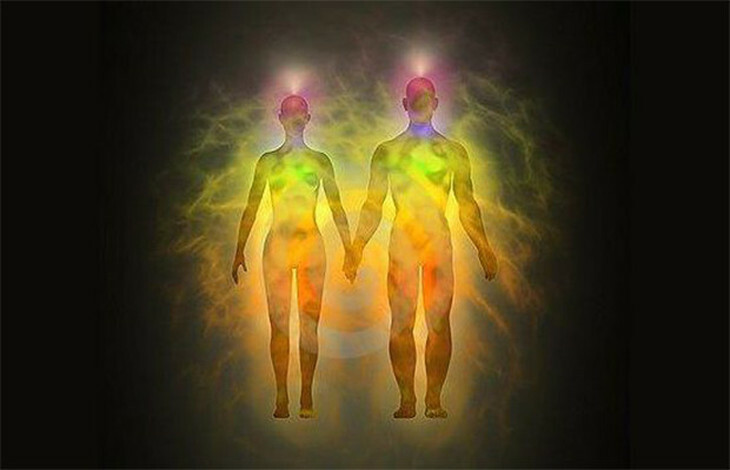 Since all things have an energetic duality we can convert and apply this to the DNA and RNA molecules which they in fact emit their own light/energy. Science shows this and mystics spanning many beliefs and philosophies throughout history speak of this wisdom in terms of The Language of Light. The root of the soul is characterized as a sacred spark or central source of individual light/energy that helps regulate human consciousness and connects and unites human consciousness with universal mind. It connects human consciousness to the universe through its deeper subconsciousness component -- soul, our deepest nature and essence. A background sea of [virtual or "dark"] light is the zero-point field of the quantum vacuum. The solid, stable world of matter is sustained every scintillating instant by this underlying sea of quantum light. The primordial infrastructure of existence is light. Holograms are a manifestation of the properties of light, the production and transmission of light, and the interaction of light with itself. Considering the primordial nature of the psyche, Jung reflected on the 'seeds of light broadcast in the chaos' (Khunrath) , of the 'scintillae' (Dorn), soul sparks (Eckhart), of fish-eyes at the bottom of the sea, or images of luminous serpent eyes. He spoke of the virtual light of such luminous nodal points emerging from the abyssal depths, eventually including dynamical processes and all types of universally recurring patterns of behavior in the psyche. Jung did not begin to use the term archetype until 1919. At first he interchanged it with 'primordial image' and 'dominant'. Preconscious archetypes are formative principles and structural elements, as well as typical modes of apprehension and action. Frey-Rohn characterized them as, "...not only the focal point of ancient pathways but also the center from which new creative endeavors emanated. "The archetypes, then being inherent in the life process, represented forces and tendencies which not only repeated experiences but also formed creative centers of numinous effect ." The numinous arises from the autonomous level of the psyche. The experience of the numinous also lies at the heart of Jungian therapeutic practice. Without it no transformation takes place. Jung (1973) asserts, “But the fact is that the approach to the numinous is the real therapy and inasmuch as you attain to the numinous experiences you are released from the curse of pathology” (p. 377). Archetypal images designate patterns, typical basic forms, prefigurative determinants, and the tendency to repeat the same psychic experiences. They conceal the unborn eternal archetype (unconscious nucleus of meaning) while they reveal particularized meaning and form. Such ‘oculi piscium’ (fishes eyes)” are fiery soulsparks of the World-Soul, the light of nature, divine sparks of the spirit. Paracelsus perceived scintilla or sparks of this new light, calling it the Lumen Naturae. We might liken them to a quanta of the pleroma or void - a glimmer of the divine within. Holographically, each level of emanated creation contains within it a "spark" or "scintilla" of the divine, making it "like" the divine. Jung termed the nondual "Pleroma," where nothingness is the same as fullness"...an Absolute in which there is no division between subject and object. Jung intuited this nondual Pleroma to be a collective transpersonal reservoir, an ocean of collective unconscious. From this omnipotent universal Pleroma our individual psyches coalesce around "attractor archetypes." In this sense Jung echoed the axiom: "Emptiness is Form, Form is Emptiness." The spark, or scintilla, which is placed in the human soul, represents the possibility of the psyche's reunification with the unconscious -- unification of a conscious, individuated personality with the full range of oppositions and archetypes in the unconscious mind. "Our aim," Jung tells us, "is to create a wider personality whose center of gravity does not necessarily coincide with the ego," but rather "in the hypothetical point between conscious and unconscious" (Jung, 1929/1968, p. 45). This 'solar' aspect of the Self is the centrum, the indwelling scintilla animae. Shekhinah descends to raise up the collective lights of the whole created world. Jung called this light the lumen naturae which illuminates consciousness, the light of the darkness itself. Consciousness has always been described in terms derived from the behavior of light, so Jung assumed that these multiple luminosities correspond to tiny conscious phenomena. Jung interpreted this imagery as symbolizing the emergence of consciousness. Jung noted, "Alchemy too has its doctrine of the Scintilla, the little soul-spark. In the first place it is the fiery center of the earth. For all things have their origin in this source." At the common root, matter, energy, light and consciousness share a metaphysical essence -- information. Light does not always behave like a continuous wave. It is grainy because energy can be transferred only in quantum packages. Therefore, light has a dual character. Under certain circumstances, it displays wavelike aspects. In other circumstances, it may have the characteristics of particles. Referring to quantum theory, Bohm's basic assumption is that "elementary particles are actually systems of extremely complicated internal structure, acting essentially as amplifiers of *information* contained in a quantum wave." The zero-point field is a blinding light. containing all the energy potential available to the Universe. DEEPAK: Well you know, Eastern spiritual traditions say that when we die we return to the state of pure potentiality. Which is our pure consciousness. But, even there we retain memories as superpositions of possibilities. I'm now translating in modern language. They would say that reincarnation is actually the localization, once again of those possibility fields. That we are part of a larger possibility field. Which is called the Akashic field. It's transcendent, being transcendent its non-local, being non-local it cannot be destroyed. It's immortal. PHOTONIC BODY is a biohologram projected by coherent light and sound. We arise from and are sustained by field phenomena, waves of biophotonic light and sound, which form our essential nature through acoustic holography This coherent light transduces itself into radio waves (holographic biophoton field), which carry sound as information that decodes the 4-D form as a material object. Photons are light particles or packets of energy that escape from their storage in cells. When energy is released from a molecular construction, photons appear. Biophotons (ultra weak photon emissions) are emitted from biological organisms as weak EM fields in the optical range. Usually, that kind of energy stays in the body for metabolic processes, which transfer matter from one kind of molecule to another. Some transfers use energy, others release it. Usually there is not enough energy to release a light particle. But the body sometimes releases measurable photons from a large surplus of energy derived from oxygen. Molecules seek a balance in energy exchange, so biophotons are only released when there is imbalance between entropic and negentropic processes. Cells use photon flux to carry information. DNA emits EMF in the light spectrum. Light emission signals functional state. A highly-organized well-tuned body produces very few biophotons; an untuned body or disorganized system releases more. A sick body has low organization and high emissions of photons. For example, cancer cells and healthy cells display differences in biophoton emission. Unrelated processes can generate random photon patterns, all unrelated to one another. Well organized systems have less chaotic photon emission levels. They are more coherent. Living systems need to find that synergy that is neither too loose nor too tight for rapid adjustment. Healthy biophotonic processes facilitate communication among systems, regulating life processes. The coherent biophoton field structures and organizes the body. Some of these coherence properties are consciousness-like. The coherence of the biophoton field is likely related to the ground properties of the physical vacuum. DNA emits EMF in the light spectrum. Abstract In the early Therav›da Buddhist view, the bhavaºga, literally, the “ground of becoming,” may be characterized as a relative vacuum state of consciousness,voided of all manner of mental activity known as javana. This appears to be identical to the substrate consciousness (›layavijñ›na) asserted in the later Great Perfection (Dzogchen) school of Tibetan Buddhism. This state of consciousness is presented not simply as a philosophical speculation but as an experienced mental phenomenon that can be accessed through the achievement of meditative quiescence (Ÿamatha). According to the Great Perfection school, primordial consciousness (jñ›na) may be regarded as an ultimate ground state of consciousness, and it can allegedly be ascertained non-dually through the cultivation of contemplative insight (vipaŸyan›). 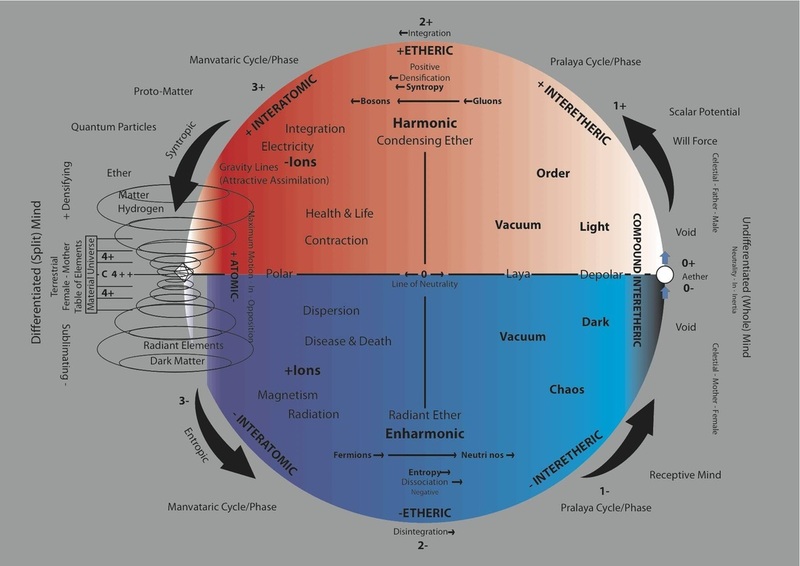 These relative and ultimate vacuum states of consciousness bear remarkable similarities with the definitions of relative and absolute vacuum states of space presented in contemporary physics. The Buddhist and scientific views may be regarded as complementary,each having its own strengths and weaknesses. [PDF]External, Internal, and Nondual Space - B. Alan Wallacewww.alanwallace.org/External,%20Internal,%20&%20Nondual%20Spac...by BA Wallace - ‎Cited by 1 - ‎Related articlesor false, vacuum and the absolute, or true, vacuum. Next I will present a. Buddhist account of the nature of the internal space of the mind, focusing on the. While the bhavanga has an internal structure and is bound by time and causality, the unity of absolute space and primordial consciousness is the absolute, or true, vacuum, devoid of all internal structure. In the “false vacuum" of the bhavanga, contemplatives reportedly experience bliss, luminosity, and nonconceptuality as distinct aspects of consciousness. But in the “real vacuum”of primordial consciousness, there is no differentiation among these experiences,or of subject and object, indicating a perfect symmetry that transcends relative space, time, mind, and matter. The bhavanga has been characterized as the ground state of the human mind, out of which emerges all mental activity of a single individual. Primordial consciousness, on the other hand, is of the same nature as the ground state of absolute space, out of which emerge all mental and physical phenomena in the universe. Now consider consciousness, inner space, the space in which dreams,mental images, thoughts, emotions, desires, hopes and fears, joys and sorrows,all arise. The fundamental discovery of Buddhist contemplatives is that the nature of consciousness is empty and luminous. Buddhist terminology is very precise in describing the characteristics of consciousness. Consciousness is empty for it is, like space, intangible and unsubstantial. Consciousness is luminous in being clear cognizance, or knowing. Additionally, consciousness can manifest in all kinds of forms. As we have just heard from physics, space also manifests, also takes on form. The difference between space and consciousness is that consciousness not only takes on form but also has a quality of being aware which, as far as we know, space does not have.If you could observe bare consciousness, without mental states, it would appear empty and luminous. What obscure the luminosity of consciousness are thoughts, mental constructs, dullness, excitation, and an endless array of mental contents. In many aspects of science, special conditions are necessary to investigate natural phenomenon. In contemplative science, the mandatory prerequisite for the investigation of consciousness is getting to its ground state, a vacuum.Entering the ground state of consciousness can be done. We have already drawn a parallel between physical vacuums and vacuum states of consciousness.Now we take the analogy deeper. As physicists distinguish between false and true vacuums in the physical world, contemplatives distinguish false and true vacuum states of consciousness. The false vacuum state of consciousness is known in Buddhist literature as the bhavanga,from Pali and Sanskrit, which is a kind of substrate consciousness. The bhavanga is a relative ground state of consciousness, more vacuous than deep sleep and free of mental dullness, in which all mental activation is dormant. The bhavanga, is an empty, luminous state of awareness and, like its analog, the false vacuum of physics, it is a potentially creative state. Mind is always distracting us. But in the face of rigpa discursive thoughts vanish. Then conceptualization is powerless. In Dzogchen the fundamental, inherent nature of everything is called the "Ground Luminosity" or the "Mother Luminosity." This pervades our whole experience, and is therefore the inherent nature of the thoughts and emotions that arise in our minds as well, although we do not recognize it.[...] What happens at the moment of death, for everyone, is this: The Ground Luminosity dawns in vast splendor, and with it brings an opportunity for total liberation—if, and only if, you have learned how to recognize it. P 32: All ordinary people have a very brief experience of the clear light of sleep but they are unable to recognize and maintain the experience. Clear light is potentially within everyone. The object is to develop the mind of clear light and use this experience as the spiritual path. clear light will appear. This appearance is like that of an autumn sky at dawn: perfectly clear and empty. P76: Although as an accomplished meditator you can abide w/in the clear light for an extended time, you must move on eventually. When you arise from the appearance if clear light the first thing you will experience is the mind of black near-attainment in reverse order. P 88: Therefore, the clear light at death can only be experienced after the cessation ogf the seventh sign of dying... [at this point begins a classical presentation of the mother and child clear lights, the mother and child luminosities. The m.l. is the ground luminosity, the clear light of rigpa. The c.l. are our intentional and other contacts with the m.l. Aware death is the union of the s.l. with the m.l. · Thus awareness, in which appearances and void are inseparable, is the natural sovereign of the three kayas, the three bodies, and the natural way of the primal state. · Although the phenomenal world is present, if you do not contaminate it by wanting and clinging, all appearances and thoughts will arise as the naked primal wisdom of the radiant void. · If you simply recognize the nature of thoughts as they arise, without extending them, leaving them free to themselves, then whatever thoughts arise are all spontaneously liberated in the expanse of Dharmakaya awareness. · [At the start of the Dzogchen lineage Garab Dorje said:] When awareness arises abruptly from the natural state of the primal expanse, this instant recollection is of the Dharmakaya, which is uncreated, unborn, unceasing. Experience this with great energy day and night, without distraction… Bring everything back to awareness itself. · After you have practiced for a long time continuously a time will come when experiences will turn into realization, and awareness will be known, naked and resplendent. It’s like taking a cover off your head, such a happy relief! It is the supreme seeing of that which wasn’t seen. From then on thoughts will arise as meditation. The quiescent and the moving will be liberated simultaneously. · Desire to understand the mind must use effort until the effort dissolves. Then the mind will be seen as it is. This effort which becomes effortless gains in depth and increases understanding. It will dissolve in awareness. · Until we are able to exhaust phenomena we are just ourselves. · We are trying to realize, but have that limited until we can free our gross body into atoms, free ourselves into light. · Until we can purify all acts and exhaust all phenomena we are our own danger. We must recognize and free our displays. Exhausting phenomena as they arise, ego dissolves. · Practice day and night. Develop luminosity in Dream Yoga. Path light becomes wisdom light….Remain unmoving and strong. Beware your own mind. · At the time of realization your likes and dislikes, joys and sorrows, and all your passing thoughts without exception leave no trace in the state of recognition. Here trace means that the thought doesn’t create any karma if it is liberated immediately, like drawing on water. It is “unceasing self-occurring self-liberation". · The first instant that a thought arises in the mind there is no karma, in a yogi or in an ordinary person. However, in the second and third instant of its arising samsaric seeds are being planted and karma is being created. · Whatever arises is food for naked empty awareness. Whatever takes place is a procession of the supreme Dharmakaya. Without imprint it is self-purifying. Marvelous! · Act to reveal your true nature, unimpeded naked awareness, free from the hollowness of attachments to imaginary projections. Then you naturally realize transcendent unimpededness, the indescribable boundlessness of rigpa. · You must never dissociate from the great absorption of your own being. The own-being of your thoughts is really the luminous ground of rigpa. If you realize it then that’s called “luminescence dwelling in the ground”. · The great meditation in which there is nothing to meditate, dwelling in primordial wisdom, is the “river-flowing yoga”. In it there is nothing to meditate on nor a split second in which to waver. · Liberating thoughts as they arise they don’t leave the Dharmakaya nature. · All thoughts are in their own nature empty, in the uttermost depths of non-discontinuous luminescence. · When thought ceases, Dharmakaya is realized. It’s automatically present, nondual wakefulness. Practice with uncreated nondistraction. Grow accustomed to it. When you are free of thinking all is known. In the absence of thought wide-awake being is present. Whether you sit or walk, train in that. · Rest utterly free, seeing vividly. Let go into vivid wakeful clarity. The essence of original knowing is basic space. When attention strays toward an object of consciousness, in that expression it becomes dualistic consciousness, perishing moment to moment. Seeing with evident wakefulness great cognition is nonverbal and free of time. An early lesson in Qabalah teaches us that the AIN is a ‘nothingness’ with a hidden or invisible potential from which the Universe will eventually manifest. All worlds are the result of a constriction and lessening of the Infinite Light (the Ohr Ein Sof), and are, to one degree or another, limited and defined. That is to say, the revelation of G-d is less or more limited, depending on which world is referred to. Therefore the word for "world" in Hebrew, "olam," is etymologically related to the word "he'elem," meaning concealment -- referring to the concealment of G-d's Infinite Light. In the higher worlds the Infinite Light is more revealed, and in the lower worlds the Infinite Light is less revealed. The light is revealed in each world by what Kabbala calls the sefirot. These are divine emanations by which G-d reveals Himself to man and by which He conducts the worlds, as the introduction to the Zohar states, "You are He who brings forth ten…sefirot." Ayn Sof Or (lit. Endless Light, or Light of the Endless; pronounced "or" as in 'oar'). But these are only distinctions in human thought. The negatively existent Absolute Being, or shall we say "Mysterious Unknown at the Roots of All Things," alludes to a depth of consciousness beyond Name and Form, and beyond the finite and supernal aspects of the Tree of Life. Individual consciousness cannot usually sustain this experience at length. In fact, most souls do not return from the experience in the roots. Their shells of embodied existence (qlifoth) dissolve completely, and they pass from their physical sheath (i.e. die). In Qabalah, the negatively existent Absolute Being is also called the "NOT" (Heb. Lo, pronounced "lo" as in "below"). "The Book of THAT Which is Concealed is the book of the balancing in weight. Until NOT (Lo) existed as weight, NOT existed as seeing Face-to-Face. And the Crowns of the Primordial Kings were found as NOT. Formed and communicated the Garments of Splendor. That weight arises from the place which is NOT Him. Those who exist as NOT are weighed in YH (Yah). In His body exists the weight. NOT unites, and NOT begins. In YH have they ascended; who NOT are, and are, and will be." "1.1 The Tao that can be trodden is NOT, the enduring and unchanging Tao. The name that can be named is NOT, the enduring and unchanging name. 1.2 Conceived of as having no name, It is the originator of Heaven and Earth; conceived of as having a name, It is the Mother of all things. 1.4 Under these two aspects, It is really the same; but as development takes place, It receives the different names. Together we call them the Mystery. Where the Mystery is the deepest is the gate of all that is subtle and wonderful." "This is the tradition: Were the Eye closed even for one moment, no thing could subsist. Therefore, It is called the Open Eye, the Holy Eye, the Excellent Eye, the Eye of Fate (mazal), the Eye which sleeps not nor slumbers, the Eye which is the Guardian of all things, the Eye which is the substance of all things." "The Ancient One is hidden and concealed. Small Face is manifested and NOT manifested. The manifested is written in the letters. On the Tree, Vast Face is associated with the uppermost center at the crown of the head called Sefirah Crown/Above. Sefirah Crown/Above is a condition of Pure Being, a supernal station of superconsciousness that witnesses the singular modification "I AM" or simply "I." Even this singular modification disappears in the negatively existent roots of the Tree. The Sefer Yetzirah teaches that the spheres (Sefiroth) of the Tree emanate in pairs. Sefirah Crown/Above emanates with its polar opposite Sefirah Foundation/Below. The tension between these two Sefiroth manifests the descent of the Central Column of the Tree. The unmanifest Pure Being of Vast Face in Sefirah Crown/Above is reflected in the abysmal mirror of Sefirah Foundation/Below as veils of illusion appearing as planes of existence (see Diagram). These planes are unmanifest in the most sublime World of Atziluth (Emanation). The attributes of the Ayn are reflected in this mirror as the immense I-ness of Small Face as the Creator, Sustainer, and Destroyer of the universe. These attributes appear as finite in the consciousness of the embodied soul ensnared in the illusion of separation. The energy of consciousness of Small Face manifests the planes of existence in the lower three worlds of B'riyah (Creation), Yetzirah (Formation), and Asiyah (Making, Activity). Like Sefiroth Crown/Above and Foundation/Below, the two central Sefiroth Knowledge/First and Beauty/Last emanate as a pair, and represent two opposite stations in the consciousness of this Small Face I-ness. When the immense I-ness is centered in Sefirah Knowledge/First, It has the singular awareness that "I am Nothing;" when centered in Sefirah Beauty/Last that "I am All." The composition of the Tree and the four worlds are discussed in other pages of this site. When referring to the active aspect of the NOT (Lo), the Zohar speaks of "Small Face" (Ze'ir Anafin, also Ze'ir Afim), represented by the letter Alef. Small Face is the power of the Ayn to superimpose billions of illusory universes (and their apparent sustenance and dissolution over time) upon the Vast Face of the Deep. The generation of universes is brought about by the balanced tension between Vast and Small Face, or between the Ayin and the manifest Alef of Unity. In the Sifra Detzniyutha, this tension in the Tree is called "weight" and the "balancing in weight." The relationship between Vast and Small Face is depicted in the Tree of Life ( see Diagram). Some of the most important Names of Small Face are YHVH , El (pronounced "ale," opposite of Lo), and Adonai (Lord, Master). Each universe has its own Small Face who-like a dreamer who knows he/she is dreaming-creates, sustains, and dissolves the Creation moment by moment by moment. Our sense of time is formed by our imperfect perception of the higher planes of existence. Our hopes for the future and our memories of a past (also created, sustained, and dissolved moment by moment) instill the impression that time is onflowing. To access the consciousness of Vast Face, one must renounce Small Face (in whose dream you are a creature) for release from the dream universe. Hence, it is "only through the Son (Small Face) that one can know the Father (Vast Face)." The Small Face Alef is known as the "manifest Alef of Unity." Qabalists (and Sufis and Tantrikas) take the allusion of the alphabet quite literally, and see the universe as built from combinations and permutations of the letters that emanate from and return to the Alef of Unity. In Sanskrit, the Alef of Unity is called the Omkara . The Alef a of Unity/Omkara has unmanifest (Vast Face) and manifest (Small Face) aspects. In its unmanifest, inactive aspect in the roots of the Tree, the Alef a of Unity/Omkara is the undifferentiated source from which emanate the supernal Hebrew/Sanskrit letters in the uppermost center of the Tree of Life (Sefirah Crown/Above). At this point, the unmanifest letters stand alone and have not combined into Names. The letters vibrationally differentiate when the Alef of Unity becomes manifest in the throat Sefirah Knowledge/First. Each letter bears a characteristic root vibration or seed sound (Sans. bija). The Alef of Unity/Omkara is therefore called the "Seed of Seeds" (Bija of Bijas). Vocalization of the seed sounds is enabled by the vowels in the throat Sefirah Knowledge/First. The vowels also empower the undifferentiated Names in the supernal Sefirah Wisdom/East to become manifest with a characteristic vibrational signature in the World of Creation (see Diagram). The Sinatic Alef is written by scribing the vertical line first (Central Column), from the top point (Sefirah Crown/Above) downwards. Then the horizontal line is scribed from right to left (Column of the Right). Finally, the diagonal line is drawn from the left end-point of the horizontal line upward to the right across the vertical stroke (Column of the Left). The Columns of the Left and Right are opposite reflections in the clear mirror of the Central Column. In the Etz HaChayyim (Tree of Life), the vertical stroke is called the Line of Light (Kav). The Alif in Arabic uses only this vertical stroke, reflected in the principal Working Tree in the Sufi tradition that only uses the Central Column. The Cross is the Christian Alef +, with the diagonal stroke of the Column of the Left removed. The "weight" referred to in the first verse of the Sifra Detzniyutha is the single combination of all the Sefiroth on the Tree. Weights are the individual Sefirah. The Primordial Kings allude to the unmanifest "Alef Worlds" or witness states of Vast Face in Sefirah Crown/Above. The "Crowns of the Primordial Kings" are the Sefiroth in the supernal World of Atziluth (Emanation), and the "Garments of Splendor" are the manifest Sefiroth in the successive three worlds. In the Torah, "Earth" (Aretz) is a synonym for the Sefirah Malkuth/Kingdom. Hence, the phrase "And the Earth was nullified" infers that matter was absorbed and disappeared. The Sifra Detzniyutha, and in smaller measure the Idra Rabba Qadusha (Greater Holy Assembly) and Idra Zuta Qadusha (Lesser Holy Assembly), also contain some wonderful verses pertaining to the allusions of the "beards" of the two Faces. The hairs of the beards are the Atziluthic letters convoluting into Divine Names in the World of Creation. The beards are said to each have nine formations i.e. strands manifest in Small Face, with four more inside the Skull of Vast Face as the Hidden Brain. The strands of the Names of Vast Face (see Diagram) generally convolute to the Atziluthic letter Ayin, and those of Small Face (see Diagram), to the Atziluthic letter Alef. "The Beard of Faith, NOT (al), is mentioned because it is the most precious of all. That is the upper one [Vast Face]. In speaking of two "Faces," it must always be remembered that we are talking about an absolute unity that is only differentiated by human thought, and can only be directly experienced in higher states of consciousness. Generally, mystical traditions are very fluid and flexible in assigning gender to Vast and Small Face. In most mystical traditions, both Vast and Small Face can take either the masculine or the feminine gender. Within a particular tradition, one may find Vast Face referred to in the masculine and Small Face in the feminine, and/or vice versa. The two Faces may also be both masculine or both feminine. In the Qabalah, for instance, we find many references to the white-haired ancient father and the raven-haired youthful king. We also find the ancient mother and the maiden Shekhinah. In virtually all traditions, we can also find many impersonal names and references to Vast Face that are neither masculine nor feminine. However, Small Face, as the active principle, is always named and referred to personally as masculine and feminine. It is cogent to note that the Torah commands us to "Honor thy father and thy mother." While this is commonly understood to refer to one's earthly parents, its higher meaning enjoins us to honor our Divine Father and Mother. The great and beloved nineteenth century Bengali saint Sri Ramakrishna Paramahamsa offered several useful analogies to the relation between Vast and Small Face (static and active aspects of the Divine). These included the relation between milk and its whiteness, a gem and its sparkle, a flame and its power to burn, and the Sun and its rays. An old Vedic analogy compares God to a spider that spins a web from and retrieves it back into its own body. An analogy in Qabalah cites the relationship between the letters of the alphabet and the vowels: without the vowels (active aspect), the letters (inactive aspect) cannot be pronounced. In the Tantra, it is said that "without the vowels, Shiva's bones can't dance." "A man was walking down a road in the country at dusk. Just as he turned a corner, he encountered what appeared to be a large snake. His whole body gripped with fear, and without thought, he jumped back to avoid getting bitten. As he looked at the snake, he noticed that it wasn't moving. He picked up a rock and threw it at the snake, and still the snake didn't move. He thought, 'Perhaps the snake is dead.' This thought diminished his fear, and he inched closer to the snake to get a better look. As he neared the snake, he was amazed and relieved to find out that it wasn't in fact a snake at all: it was a rope that he mistook for a snake." In this story, there had to be a rope in the first place for the man to have mistaken it for a snake. The "snakiness" was a superimposition upon the rope that only existed in the man's mind. Such is the nature of the Creation, which is a collective illusion. The "snakiness" of Small Face is an illusion superimposed upon the reality of the "rope" of Vast Face. This illusion of a "difference within Itself" is a play of the Divine arising from an unfathomable whim. But negative existence bears hidden in itself, positive life; for in the limitless depths of the abyss of its negativity lies hidden the power of standing forth from itself, the power of projecting the scintilla of the thought unto the outer, the power or re-involving the syntagma into the inner. Thus shrouded and veiled is the absorbed intensity in the centerless whirl of the vastness of expansion. God is conceived of as beyond the Three Negative Veils of Existence, (Limitless Light, Limitless, and Nothing), as the Unmanifest, in the Qabalah. Likewise it was common Gnostic principle (as well as being a general approach in mysticism as a whole [see the Cloud of Unknowing, for example]) to define God in negative terminology. The three veils reside above the tree of life and represent the outer limit of existence and the initial impulse of creation. Ain is the highest and first of the veils. It is literally translated as 'nothing', or simply 'no'; it is absolute emptiness, the opposite of existence, complete absence. Ain Soph is the middle of the three veils, and it proceeds from Ain by necessity. It is literally translated as 'no limit'. If there is nothing then there are no boundaries or limitations; this is the limitless foundation - the eternal in its purest sense. Ain Soph Aur is the lower viel, situated closest to the Tree of Life, and it proceeds from Ain Soph as a necessity. It means 'limitless or eternal light'. Without any limitations, all things happen by virtue of the fact that there is no reason why they shouldn't. Light plays a very important role in the philosophy and symbolism of Qabalah, and the Ain Spoh Aur is that light. Light means many things to a Qabalist - the light of wisdom, of life, of grace and so on, but in attatching all these associations it is important to remember that these refer to our human experience of light, and the way an inner communion with the eternal light can heal and transform you, but not the simple nature of light in and of itself. So what is the nature of this mysterious light? In metaphysics such questions can be over-analysed; the light of Qabalah is the same as the light described in science and experienced in our every day life, it is just that it is experienced in a more direct (gnostic) manner, or to be more precise, in the manner that it experiences itself. As Einsteins theory of relativity explains, if you were to travel at the speed of light then strange things would happen tp space and time, and you would experience yourself to be in all places and times at once. You would, in other words, be eternal. This is the experience of light from its own perspective. When the world was created and the first light came into being this the entirety of space and time were created and held in a single moment (moment is an innapropriate word, but there is no other)within the nature of light itself. This eternal moment was the Ain Spoh Aur. 3) Ain-Soph Aur - "The Nothing-Thing Without End of Unlimited Light" / endless duration (before matter). Now, please keep in mind, that these abstract ideas are being expressed in words for the purpose of attempting to comprehend the incomprehensible. Therefore, when individuals begin arguing about the technicalities of which aspect of Nothingness is infringing on another aspect of Nothingness - it's simply a mental exercise that can go 'round and 'round 'ad infinitum'. However, we can also appreciate the unique human quality that drives us to find logic in an area of speculation that is beyond physical matter. 3) Ain-Soph-Aur as "the higher mind of I AM that is illuminated by the unlimited wisdom of the spiritual-self". The Qabalists recognise four planes of manifestation, and three planes of unmanifestation, or Negative Existence. The first of these is called AIN, Negativity; the second, AIN SOPH, the Limitless; the third, AIN SOPH AUR, the Limitless Light. It is out of this last that Kether is concentrated. These three terms are called the three Veils of Negative Existence - depending back from Kether; in other words, they are the algebraic symbols that enable us to think of that which transcends thought, and which at the same time hide that which they represent; they are the masks of transcendent realities. If we think of the states of negative existence in terms of anything that we know, we shall err, for whatever else they may be, they cannot be that, being unmanifest. The expression "Veils," therefore, teaches us to use these ideas as counters, of no value in themselves, but useful to us in our calculations. This is the true use of all symbols; they veil that which they represent until we can reduce them to terms we can comprehend; nevertheless they enable us to use in our calculations ideas which would otherwise be unthinkable. But although we say that Negative Existence is outside the range of our realisation, it does not mean that we are outside the range of its influence. If this were so, we could dismiss it as non-existent so far as we are concerned, and our interest in it would be at an end. On the contrary, although we have not direct access to its being, all that we know as existing has its roots in this Negative Existence, so that, although we cannot know it directly, we have experience of it at one remove. That is to say, although we cannot know its nature, we know its effects, in the same way as we are ignorant of the nature of electricity yet are able to turn it to good account in our lives, and from our experience of its effects we are able to come to certain conclusions concerning some at least of the qualities it must possess. Those who have penetrated furthest into the Unseen have given us symbolic descriptions by means of which we may turn our minds in the direction of the Absolute, even if we cannot reach it. They have spoken of Negative Existence as Light: "Ain Soph Aur, the Limitless Light." They have spoken of the First Manifest as Sound: "In the beginning was the Word." For the purposes of their system, therefore, they draw a veil at a certain point in manifestation, not because there is nothing there, but because the mind, as such, must stop there, When the human mind has been brought to its highest stage of development, and consciousness can detach itself ~ and, as it were, stand upon its own shoulders, we may be abie to penetrate the Veils of Negative Existence, as they are called. But for all practical purposes we can understand the nature of the cosmos if we are content to accept the Veils as philosophical conventions, and realise that they correspond to human limitations, not to cosmic conditions. The origin of things is inexplicable in terms of our philosophy. However far we push our inquiries back into origins in the world of manifestation, we find a preceding existence.